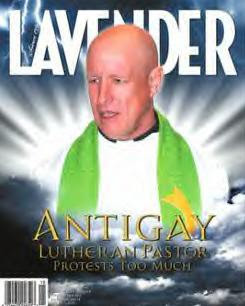 "Pastor Tom Brock became a viral sensation this week after he was outed by the local gay magazine, Lavender. Brock famously blamed the tornado that struck downtown Minneapolis on a church's embrace of gay clergy. Turns out he was caught up in a whirlwind of self-loathing. Brock has taken a leave of absence, but the hypocrite hasn't ruled out continuing to serve in the job he thinks gays shouldn't have. Look out for more tornadoes!," writes Kevin Hoffman. "The most surprising part about the story is just how common it is: We've become accustomed to homophobes being closeted homosexuals. At this point, if someone loudly advocates against gay marriage, it's a good bet they're just trying to preserve all the young, single guys." Continue reading: The Top 5 homophobes who turned out to be closet cases.